I thought you’d be glad to find out that, luckily, things were much more exciting these past few hours in the cosmological world. How exciting? We’re talking seven beautiful women floating in the air with a severed head in tow. According to the legend of Songkran (Thai New Year), Kapila Brahma (Kabinla Phrom), the four-faced god/king, lost a bet which resulted in him having to cut off his own head. The story isn’t clear about how the puzzling and potentially awkward act of self-decapitation is done, but it goes to great lengths to tell us what an environmental hazard Kapila Brahma’s head is. You see, if the severed head drops to the ground, it will put the whole earth on fire. If it’s left floating in the air, it will result in no rainfall and earthlings will die of drought. If it’s thrown into the ocean, all bodies of water will dry up. As you can see, this is no ordinary head; it requires special handling. And, basically, unless the god’s head is handled properly, we’re all pretty much—excuse my language—screwed. As is the case with most ancient stories, things are often left unexplained. The legend of Songkran is no different; it does not tell us how the solution concerning this head issue was reached. All we’re told is that the only way to protect the earth is to put Kapila Brahma’s severed head on a plate and every year his seven daughters will take the plate, circumambulate the sacred Mount Meru then make their way to a cave in Mount Kailash where their father’s head will be deposited. And I know what you’re thinking. No, the legend is mum about why the head can’t just stay put somewhere but needs to be moved around thereby creating what appears to us mortals as an unnecessary risk. Believe me. I searched. I asked around. Nobody can explain why. The procession passes through earth every year around the same time. This year, it arrived on Friday, April 13th, at 19.46.12 hours. While I was making a sandwich in the middle of which some ham and cheese were positioned, if I had looked up the firmament, I might have seen seven goddesses whoosh by, carrying with them a plate of head, with one of them leading the procession. The date and time of the procession’s arrival on earth are crucial; they determine which of the seven goddesses will lead the procession and in what manner she will arrive. This probably doesn’t make a whole lot of sense to you. It doesn’t make sense to me either. But things in the cosmological world, based on my observation, rarely do. Anyway, since Songkran falls on a Friday this year, it’s Kimita (Kimida – Sanskrit), the Friday goddess, who leads the procession. And since the time of her arrival (which coincides with the time the sun moves into Aries according to the lunisolar calendar) is in the evening, she’s arriving on a water buffalo’s back, reclining with her eyes open. Had her visit taken place a little earlier in the morning, she would have arrived standing on the back of said water buffalo. Had she got here after midnight, she would have come reclining on a water buffalo with her eyes closed. Don’t try to understand any of this. I quit trying years ago. It’s more fun this way. Confusion is exhilarating, and clarity is mind-numbingly dull. Please just stay with me. Now, what’s interesting about these goddesses is that each one of them has a favorite food. Last year’s goddess, Kirini, likes to eat nuts and seeds, and if you’d like the recipe for Thai-style peanut-sesame brittle, please check out this video). This year’s Songkran goddess likes to eat – you guessed it – bananas. So I made some fried bananas as a way of welcoming her. I figured it’s a nice gesture to have a little something to offer our celestial visitor who has traveled from afar. 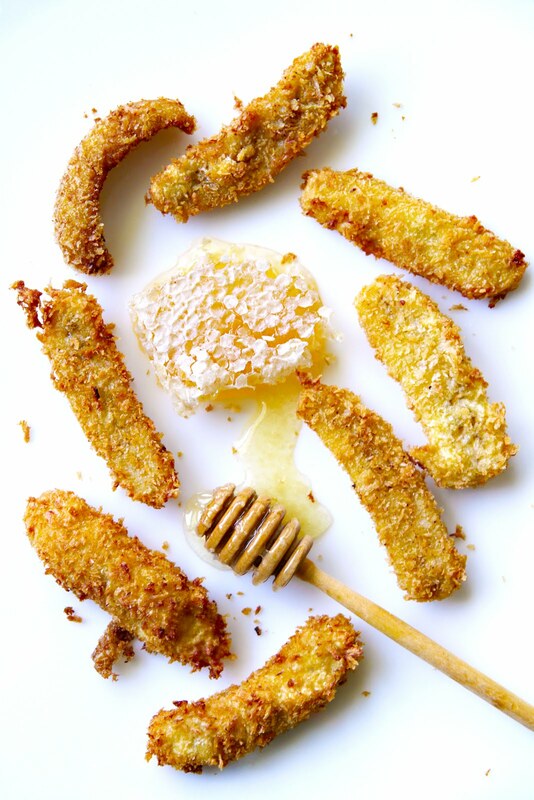 Instead of the traditional Thai fried bananas, I made panko-crusted fried baby bananas to be served with honey. They’re good in a different way and I like them a lot. Besides, baby bananas are easier to find than burro bananas which you need to make the kind of Thai fried bananas as found on the streets of Bangkok. 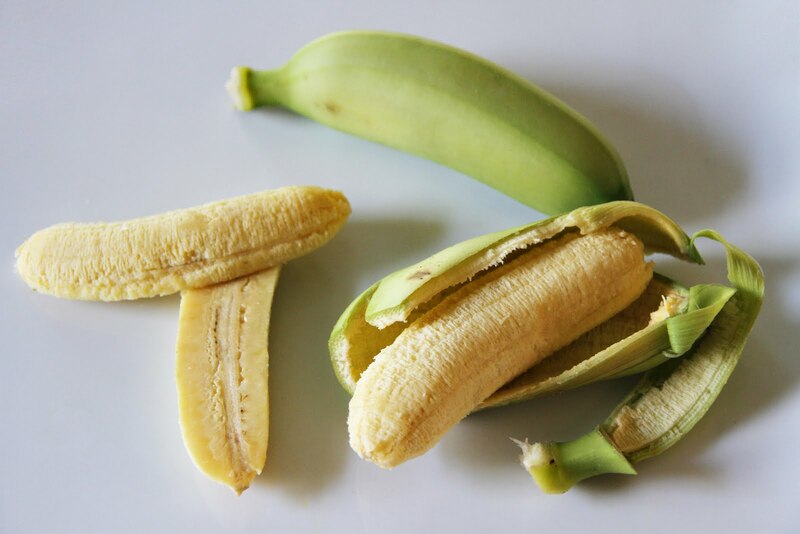 Many of you have complained about burro bananas being hard to find in your area. I refuse to make the traditional Thai fried bananas with anything but burro, but I hope this non-traditional version of fried bananas will present less of a problem to many of you. More importantly, I hope our Songkran goddess, Kimita, will be pleased with these fried bananas, because — did I mention she’s armed with a sword? All this is to say, happy Thai New Year! Heat up some vegetable oil in a small pot over medium heat, making sure the oil is about one inch deep. In a medium mixing bowl, whisk together the eggs, rice flour, and salt until smooth. Put the banana halves into the egg mixture; toss gently to coat. Put the panko on a plate. Thoroughly coat each piece of banana with the breadcrumbs, pressing as you go. 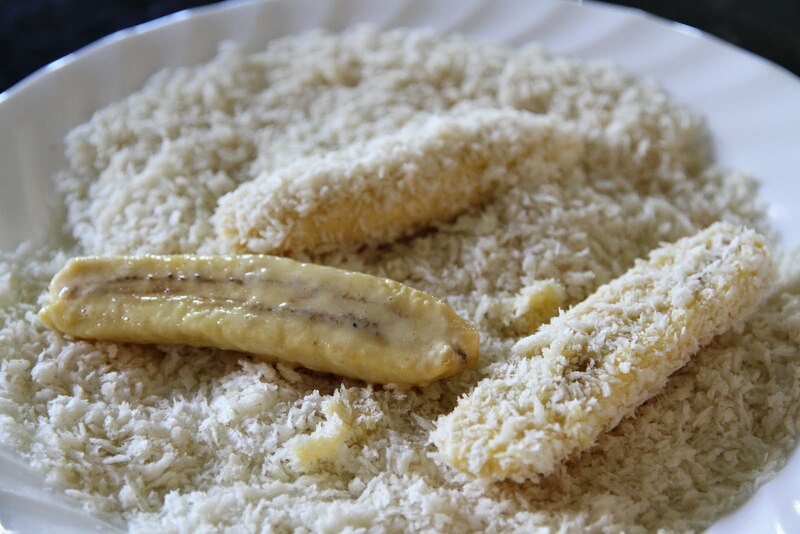 Gently lower the panko-coated bananas into the hot oil. Fry until the exteriors are golden brown and crispy. 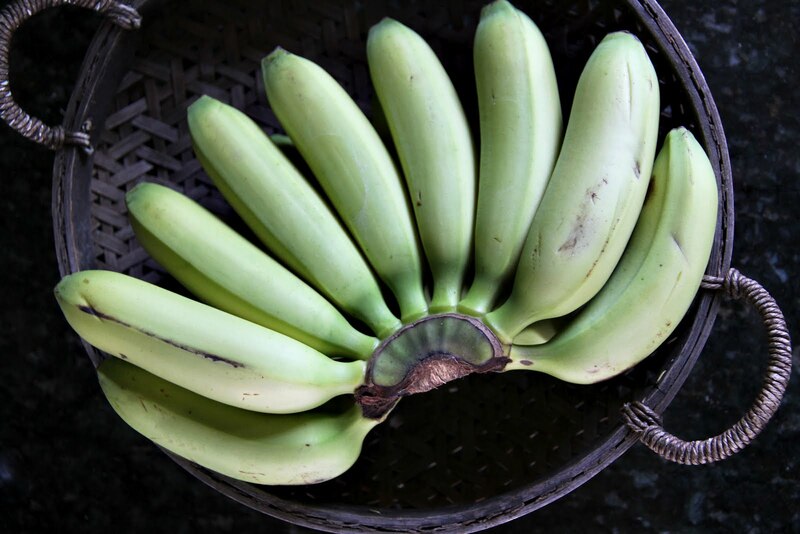 Drain the fried bananas on a paper towel-lined plate and allow them to cool to room temperature. Reference: The History of Songkran, Alisa Ramkomut, the Office of Literature and History, Fine Arts Department, Thailand. I wanted to look at the “Grandma’s Fried Banana Cakes with Warm Jasmine . . . ” link, too, but it didn’t come up. Do you know if that page still exists? BoiseNoise – I lost that post during a recent site redesign. It will be reincarnated. Promise.